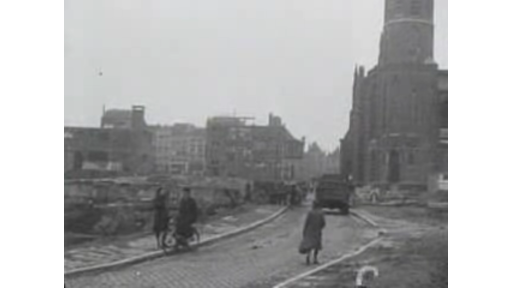 The centre of Nijmegen has been largely destroyed during World War II. Houses, shops and churches were lost or were very heavely damaged. Some people live in temporary housing in barracks; others in air-raid shelters. SHOTS: -Several shots of heaps of rubble and ruins; -some ext. and int. shots of the housing of people.